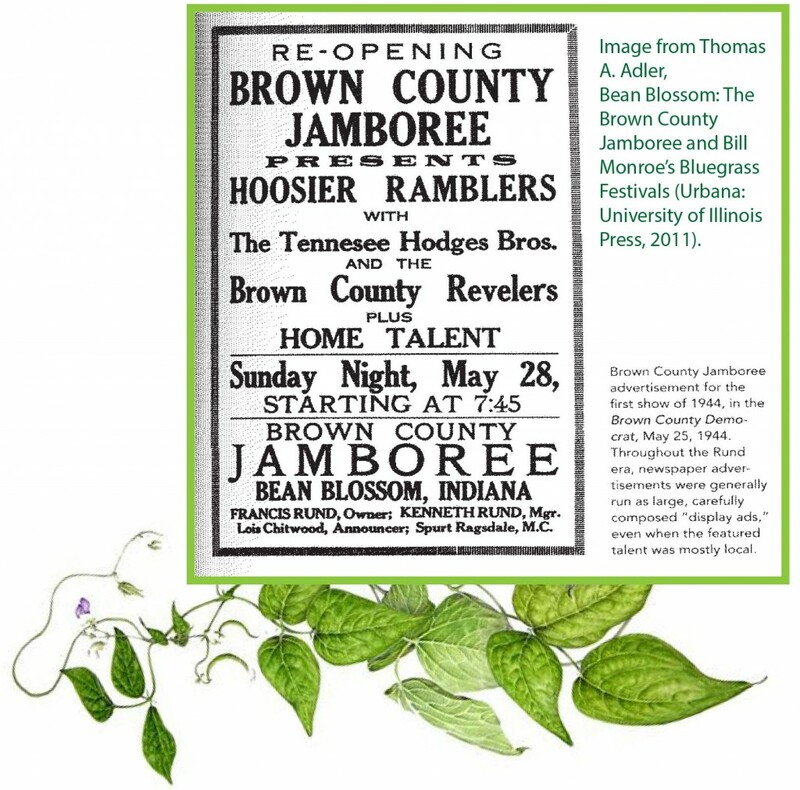 Learn about the origins of the Brown County Jamboree in Bean Blossom, Indiana in Part I.
William “Bill” Monroe’s Hoosier roots run deep. While Bill was born and raised in Kentucky, he moved to northwest Indiana in 1929 when was he was just eighteen years old. His brother Charlie had gotten a job at the Sinclair Oil refinery in Whiting, Indiana, and sent for Bill and their other brother Birch. It was the start of the Great Depression and the crowds outside the refinery of men hoping for a job grew large enough that the police had to move them so the street cars could get through. Luckily for Bill, Charlie Monroe was well liked at Sinclair and was able to help his brother to secure employment there as well. Birch was not as lucky and remained unemployed for some time. Charlie was afraid that Bill wouldn’t be able to do the heavy labor as a result of an appendectomy. Bill soon proved that he was up to the job, unloading empty oil barrels from the freight trains and cleaning them. However, Bill also had to do janitorial work at the company, something of which he was embarrassed and wouldn’t speak of publicly. Bill was also sensitive about the problems with his eyes. Bill’s vision was poor, but he was also “hug-eyed,” a term for one eye that faces inward. 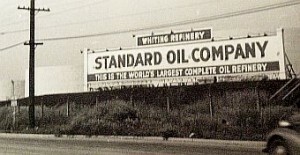 Around 1930, the brothers were still working at Sinclair and settled in East Chicago, just a short train ride away from the Windy City. Somehow Bill, likely with his brothers’ help, was able to afford an expensive and delicate eye surgery. Luckily a Chicago surgeon was able to align the eye, “a major turning point” for the shy teenager, according to Richard D. Smith’s Can’t You Hear Me Callin’: The Life of Bill Monroe, Father of Bluegrass. A lot of southerners were displaced by the Depression, but were able to bring their culture with them to northern industrial cities. The Monroe brothers were no exception. They went to square dances in nearby Hammond, Indiana, sometimes held in an old storefront. 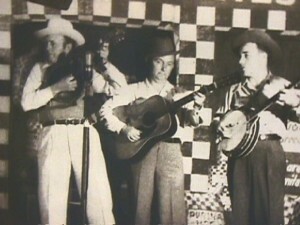 “Hillbilly music” had become nationally popular and there was demand for mountain ballads and energetic string bands for both live performances and on the radio. As they had back in Kentucky, the Monroe boys began playing at dances and gatherings around northwest Indiana. Along with their friend Larry Moore, they formed The Monroe Brothers. Despite the death of their beloved Uncle Pen, who raised Bill and influenced his music greatly, 1931 looked like a better year for the brothers. All three now had refinery jobs and a little extra money to head to the square dances in Hammond. Here they were “discovered” by country music program director Tom Owens, who hired them for a “square dance team” which performed at a traveling variety show sponsored by a radio-station. Soon after, a Hammond radio station gave The Monroe Brothers airtime, a Gary station gave them a regular fifteen minute show, and the Palace Theater in Chicago booked them to perform. The Monroe Brothers’ next break took them away from the Hoosier state. 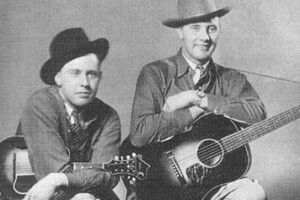 Birch kept his refinery job, but Charlie and Bill headed to Shenandoah, Iowa to perform on a radio show. They were a hit and became full-time professional musicians. During the time Bill Monroe was away from Indiana, his career took off. By 1936, The Monroe Brothers signed to RCA Victor and released a hit single, “What Would You Give in Exchange For Your Soul?” The Monroe Brothers disbanded in 1938, but Monroe quickly formed other groups, including an early version of the soon-to-be legendary Blue Grass Boys. 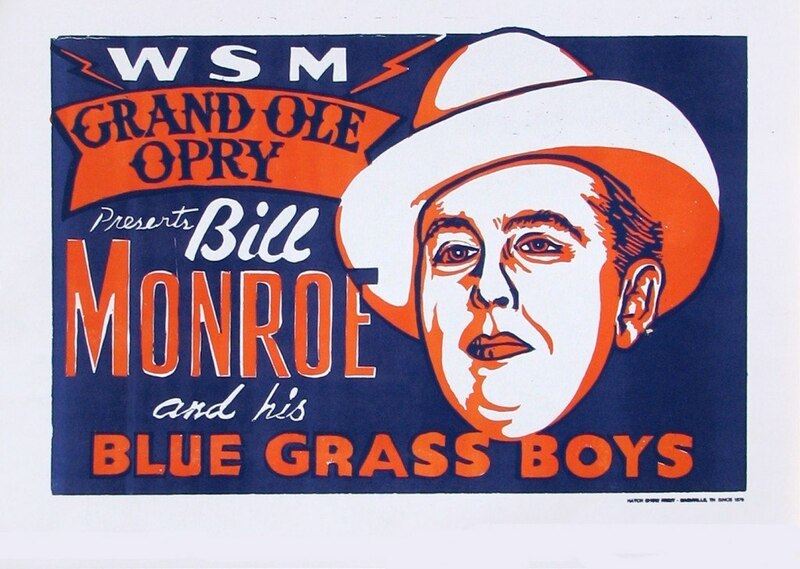 In 1939 Bill successfully auditioned for the iconic Grand Ole Opry, which made him a star. By this time, the four-hour Opry radio broadcast reached country music fans in almost thirty states and its stars became household names. With the addition of Earl Scruggs on banjo and Lester Flatt on guitar to Bill Monroe’s mandolin and high tenor voice, the classic Blue Grass Boys line-up was born in 1945. Over the next two years, the band recorded several successful songs for Columbia Records, including “Blue Moon of Kentucky,” which again became a hit in 1954 when Elvis recorded it for the b-side of his first single. Mr. Monroe, who played mandolin and sang in a high, lonesome tenor, created one of the most durable idioms in American music. Bluegrass, named after his band, the Blue Grass Boys, was a fusion of American music: gospel harmonies and Celtic fiddling, blues and folk songs, Tin Pan Alley pop and jazz-tinged improvisations. The Blue Grass boys sang, in keening high harmony, about backwoods memories and stoic faith; they played brilliantly filigreed tunes as if they were jamming on a back porch, trading melodies among fiddle, banjo, and Mr. Monroe’s steeling mandolin. By bringing together rural nostalgia and modern virtuosity, Mr. Monroe evoked an American Eden, pristine yet cosmopolitan. The famous Brown County Jamboree at Bean Blossom has new owners. Mr. and Mrs. Francis Rund, founders and owners for 13 years, have sold the Jamboree Hall to the Grand Ole Opry entertainer, Bill Monroe, of Nashville, Tennessee. This festival here in Bean Blossom Indiana . . . It means a lot to me. I bought this place here back in ‘52 and to set out to have a home base here where we could play to the folks and give them a chance enjoy and to learn about bluegrass music. And It’s really growing in this state and I’m glad that it has. With the rise of rock and roll in the first half of the nineteen fifties, people were much less interested in country music, according to Adler. This affected attendance at the Jamboree and less people visited Bean Blossom. 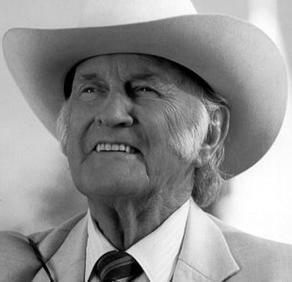 However, with the revival of the folk movement in the late 50s and early 60s, Bill Monroe and his unique style of bluegrass attracted national attention once more. 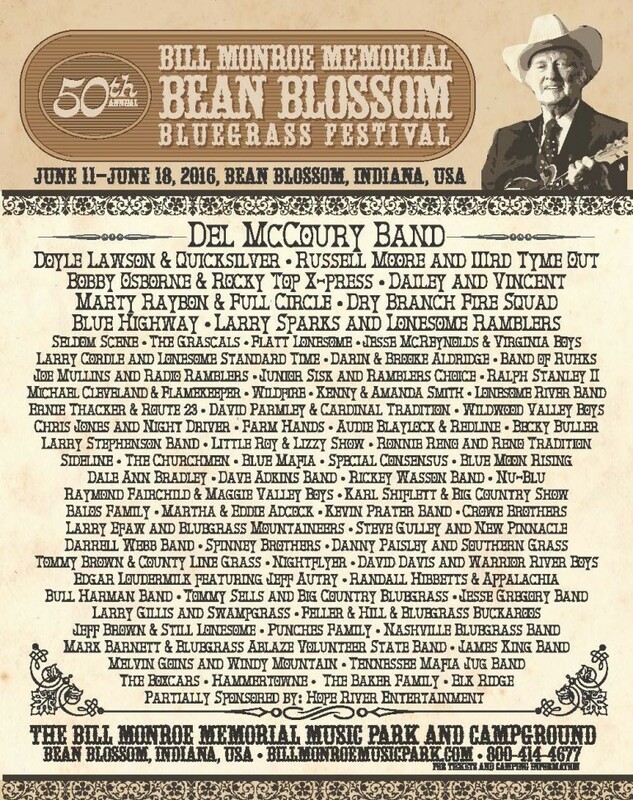 Long time New York Times music reporter Robert Shelton noted in 1959 that bluegrass “is enjoying a vogue in city folk music circles.” Shelton wrote that, through changing tastes, bluegrass was “earning the reconsideration of many serious listeners.” This reinvigorated interest in Bean Blossom as well, and the time was right for Monroe’s next move: a large annual bluegrass festival. The first annual festival hosted by Bill Monroe in 1967 was called the “Big Blue Grass Celebration.” According to Adler, Bill Monroe didn’t want to put his name on the event and didn’t want the word “festival” because competing bluegrass and folk events used the term. It was officially a two day event, June 24 and 25, but according to Adler, there were a few performances and a dance the night before. The next year the festival was extended to three days to accommodate the large crowds. This 1968 festival attracted ten thousand people. 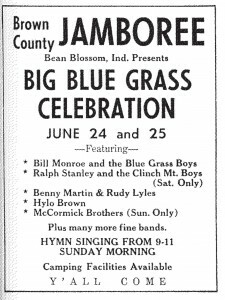 By 1969 the event was billed as “Bill Monroe’s Bluegrass Festival” and the location referred to as the “Brown County Jamboree Park.” This year the festival was extended to a four day event. According to the Indianapolis Star, highlights included “a banjo-pickin’ contest,” a bluegrass band contest, a “sunset jam session,” an “old-time square dance,” a workshop for learning bluegrass instruments, and church services. When the headlining musicians weren’t performing, they participated in “pick and sing” sessions, improvisational jams where the professionals and amateur players exchanged ideas. 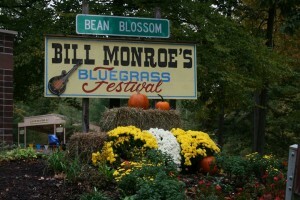 The Bill Monroe Bluegrass Festival soon attracted not just fans but also performers from around the world. The 1969 festival included “Pete Sayers, country singer from London, England,” and Adler writes that Sayers returned in 1970. However, Sayers appears to be the only foreign performer until 1971. 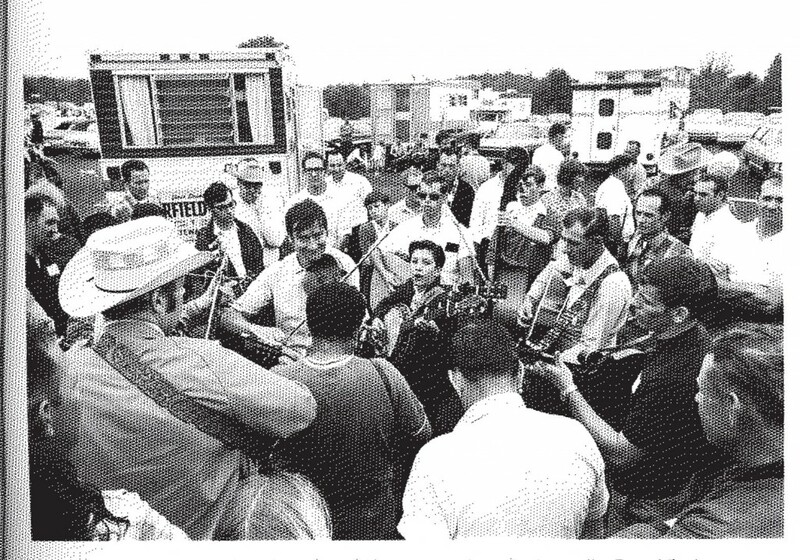 Writing for Bluegrass Unlimited Magazine in 1971, Frank Overstreet, a musician and festival attendee, reported on the event being the first international festival at Bean Blossom. He wrote, “The international aspect of bluegrass was brought to light at the festival this year by the presence of a New Zealand group, the Hamilton County Bluegrass Band and a Japanese one, The Bluegrass 45.” The 1971 festival included concerts, jam sessions, dancing, a church service, a bluegrass music school, and bands which travelled from all over to perform, including from other countries. Nonetheless, the main attraction remained Bill Monroe and the Blue Grass Boys “who started it all,” according to the Indianapolis Star. According to Adler, the “golden age of the festival” was 1972-1982, a period which saw steady growth in attendance. In June 1972, the Indianapolis News reported that the previous year’s festival drew 15,000 people and that organizers were expecting up to 35,000 people for the 1972 event. In June 1973, the Indianapolis News reported that 35,000 people attended the festival. In June 1976, just ahead of the festival, the Indianapolis Star reported that festival organizers again expected up to 35,000 people to attend. In the midst of the festival, Monroe confirmed in a locally televised interview that the numbers of attendees was above 30,000. Monroe also stated that attendees represented thirty-six different states and eight foreign counties. In 1977, the festival was extended to nine days (from seven days the previous year) to accommodate the growing crowd; organizers were expecting crowds of up to 50,000 people. He perfected his music in the late 1940’s and stubbornly maintained it, and he lived to see his revolutionary fusion become the bedrock of a tradition that survives among enthusiasts around the world . 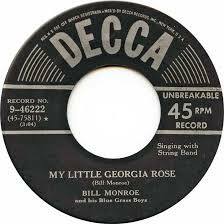 . . Every musician now playing bluegrass has drawn on Mr. Monroe’s repertory, his vocal style and his ideas of how a string band should work together. And his influence echoes down not just through country music but from Elvis Presley (who recorded Mr. Monroe’s ‘Blue Moon of Kentucky’ on his first single disk) to bluegrass-rooted rock bands like the Grateful Dead and the Eagles. Covered Bridge at the intersection of Indiana Highways 135 and 45, near the original site of the Brown County Jamboree. Courtesy of Indiana Memory. By 1939, the Great Depression had ended and Hoosiers had a little more money in their pockets. More folks had access to automobiles and most had a little bit of free time after church on Sunday afternoons. So rural Hoosiers gathered at each other’s homes, turned on the radio, and listened to variety and comedy shows and country music. 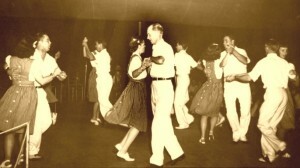 Sometimes they got out their own fiddles, rolled back the rugs, and danced, much as they had since the previous century. 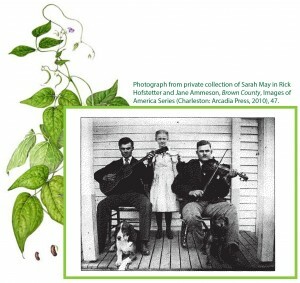 The Hendricks family of Brown County plays music on their porch, no date. 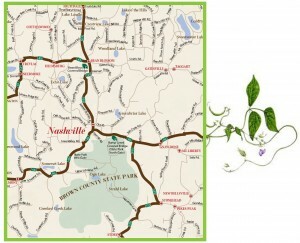 Bean Blossom, originally spelled “Beanblossom,” is located in Brown County just four miles north of Nashville. The history of the descriptive moniker is clouded with folklore. There are at least two different accounts of men with the name of Bean Blossom or Beanblossom who almost drowned in the creek which was then named for them. An alternate explanation is that it is a translation from the Miami name for the creek. 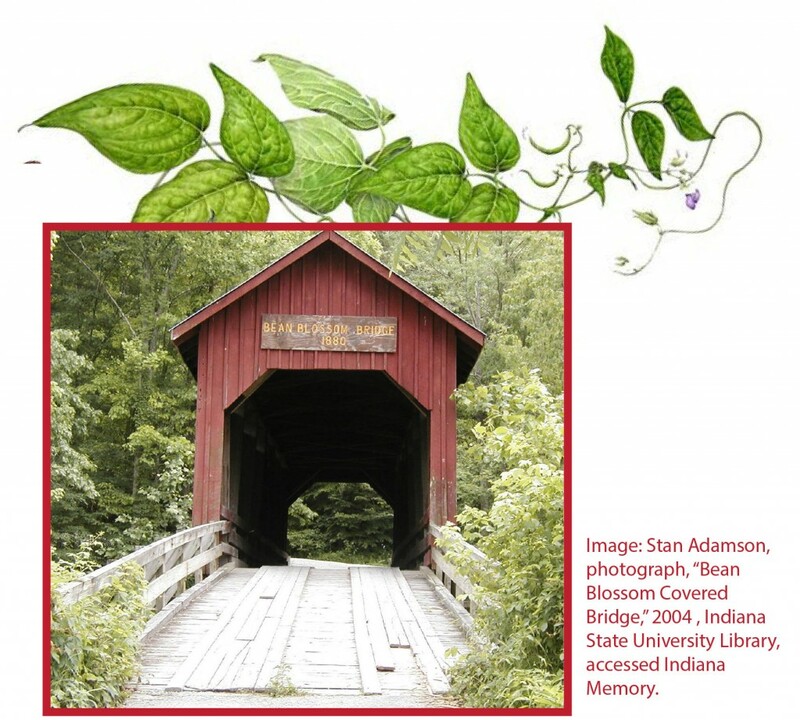 Still another tradition holds that the town is named after the wild bean plants that grew along the stream and provided sustenance for early settlers. 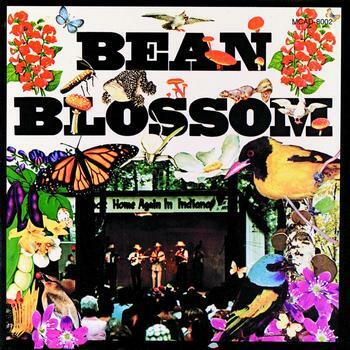 Sometime in the early forties when life in the country was a little slow, some men decided that Bean Blossom needed a little country music to lighten things up a bit. One person had an old station wagon with a sound system including a couple of big horn-type speaker mounted on the roof of the car. . . they [The car owner and two others] went through Bean Blossom and other towns, called out to those they say standing near their path or sitting in yards and porches for them to ‘Come to Bean Blossom for a free music show!’” Now, a short time earlier, about a week or two, these same country music buffs had set a microphone and speaker system up on the grassy area in front of the local filling station . . . In those days and nights were at a slow pace so a little thing like someone singing into a microphone and telling stories created a little excitement. The “free” aspect of the free show didn’t last long, as the organizers couldn’t help but see how the crowd was growing. The lunchroom business was booming and there was no reason the promoters and performers shouldn’t make a little money too. They built a small stage, fenced in the area, and started to charge twenty five cents per show. Soon, they put up a tent as can be seen in the only known photograph of the Jamboree from this period. Thousands of furrriners who have been touring Hoosierdom on their vacations and have been visiting Brown county’s hills are writing postcards to send back-home, telling their acquaintances about this rustic program of Sunday evening recitals of Brown County Music . . . Well, the fiddling and the ballad singing has gone over big for the last six weeks and traffic jams at this crossroads village in the Bean Blossom valley from sundown to almost midnight have required special duty by state police. Cars bearing many foreign tags . . . are thronging the village. Parking space is becoming a problem too. Brown County talent may soon be heard over the air, and believe it or not it will be broadcast from Beanblossom, according to Dan Williams, proprietor of the lunch room at the south edge of Beanblossom. Mr Williams states that representatives of Indianapolis broadcasting stations have been to Beanblossom several times in efforts to make satisfactory working arrangements to broadcast the programs which are being held there each Sunday night. 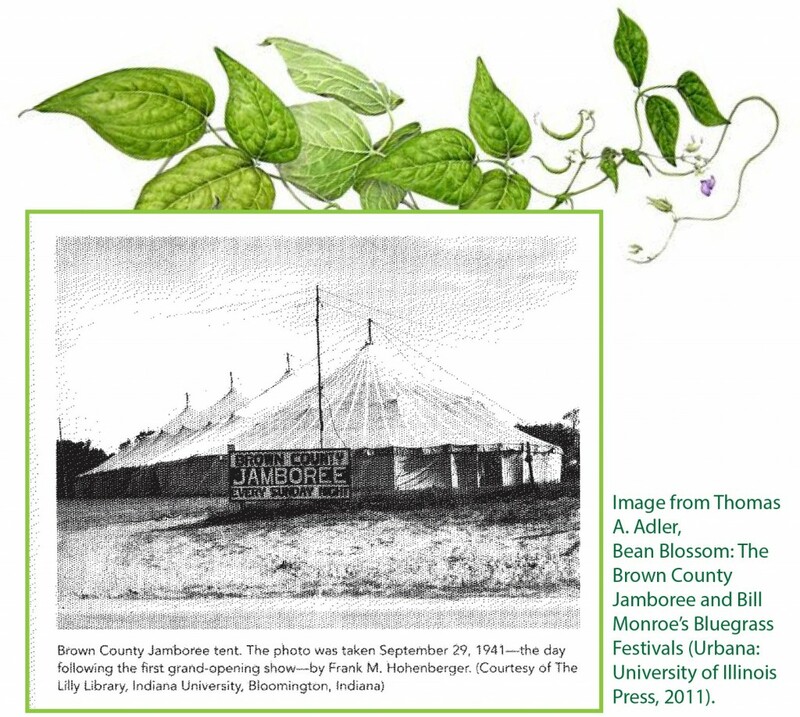 Plans for a large permanent building to be used for the Brown County Jamboree in Beanblossom to replace the tent which is now being used have been completed. . . 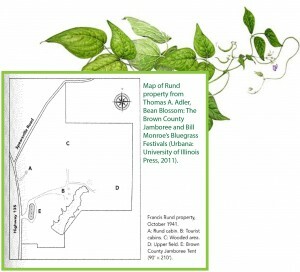 It is to be located on the land owned by Francis Rund just north of Beanblossom where the tent which houses the jamboree now stands. The shows during the Rund decade (1941-51) generally featured a variety show format hosted by an emcee which included comedic performers as well as music. However, the country and “hillbilly” music was always the main draw. Adler writes, “Brown County Jamboree shows were professional, fast paced, and entertaining. 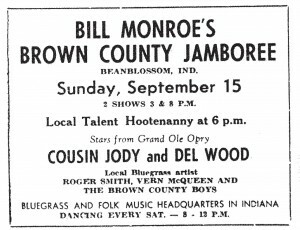 From the beginning, the music, comedy, and ambience of the site combined to present a nostalgic and entertaining whole.” The Indianapolis Star on August 10, 1941 described the Jamboree as “a co-operative program providing real, homespun talent, rail-fence variety of music and frivolity . . . old fiddlers and rural crooners, who would sing and warble Brown county ballads brought over the mountains by their pioneer ancestors.” The Indianapolis Times noted October 10, 1941 that in addition to “singing and dancing” the Jamboree included “vaudeville skits.” The Runds ran large advertisements for the Jamboree in the local newspaper and partnered with nearby radio stations, notably WIRE and WFBM, Indianapolis. On October 23, 1941, the Brown County Democrat reported that the Indianapolis radio station WIRE referenced the Jamboree many times during its programs. 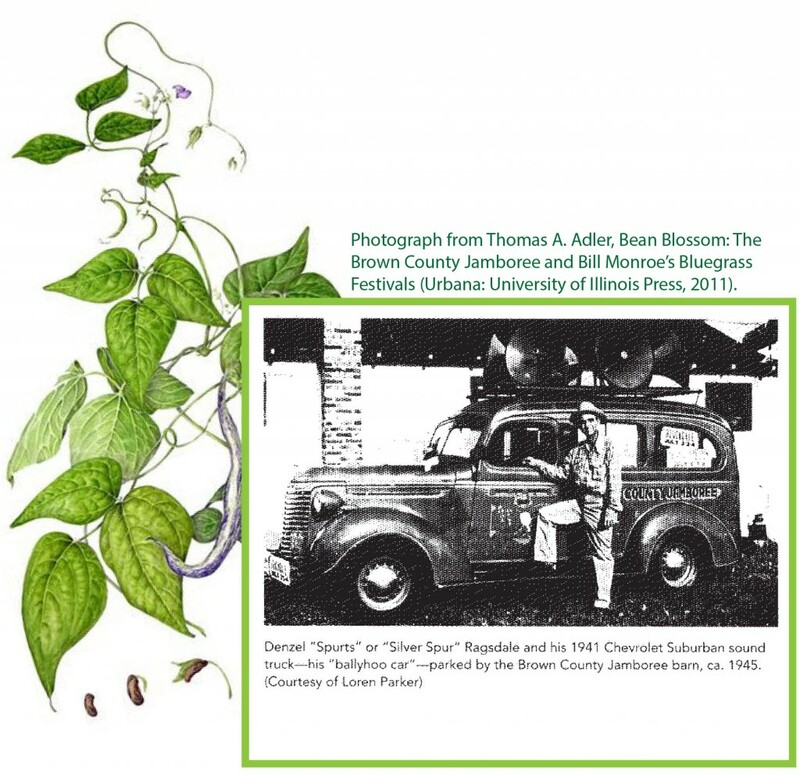 Purchase Thomas Adler’s Bean Blossom: The Brown County Jamboree and Bill Monroe’s Bluegrass Festivals in the IHB Book Shop.